The new Honda MPV aims to fill Honda’s portfolio of cars in every segment. It’s not new to hear about an MPV from Honda. Honda, manufacturer of cars known for its performance, had recently showed interest in the MPV segment and intended to have an MPV in developing markets. 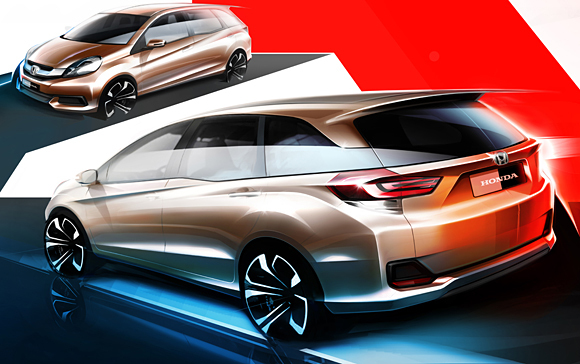 Honda today released a sketch of the new MPV which will make its debut at 21st Indonesia International Motor Show, held between September 19-29 at Jakarta. As seen from the sketch, the new MPV shares the Brio platform which has been stretched to make it an MPV. The front end looks similar to Brio with minor changes in the bumper and grill. The side profile reminds us of the Honda Oddessy with ‘Z’ shaped bottom window line, though we feel the new MPV looks better than the bulky Oddessy. The rear end bears a similar Honda design with big creases giving a muscular and futuristic look. The wrap around tail lights with some scoops are the hall mark of today’s Honda. Overall, the new MPV looks good and will fit exactly in Honda’s vehicle portfolio. According to Honda, the new MPV has been built keeping in mind the customer’s requirement and road conditions in Indonesia which is not different from India. After its debut in Indonesia, the new MPV (Brio MPV) will soon make its way for India as well. In Indonesia the new Honda MPV will be powered by renowned Honda 1.5L i-VTec gasoline engine and we guess a diesel variant with new 1.5L Earth Dreams diesel will be added in India, to fit in the segment dominated by diesels. The new MPV has been designed to accommodate 7 seats with 3 rows configuration just like that of the Ertiga. The new Honda MPV features an innovative design, spacious cabin and advanced safety features which again is the hallmark of Honda. Price when launched in India? Could be around Rs. 10 lakh.